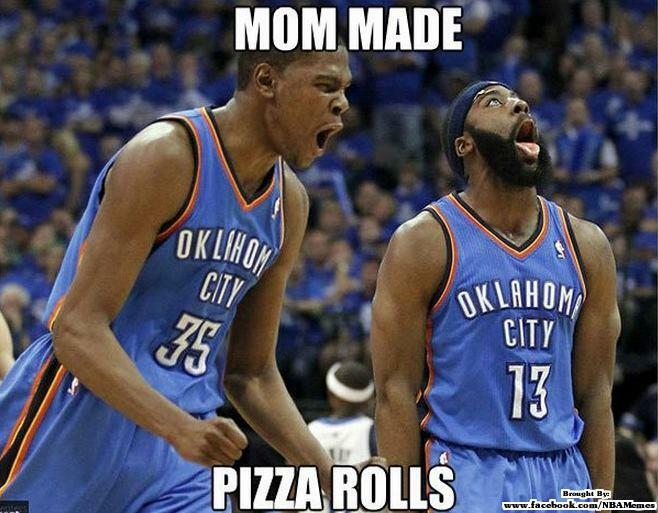 The very elemental 2012 NBA finals tip off tonight between the Heat and Thunder, and while we don’t know which way Captain Planet’s going with this one, I did think everybody outside of South Beach was on board with cheering for Oklahoma City. Probably more accurately, I thought everybody was on board with rooting against LeBron James & co.
Now that King James is (again, admittedly) on the verge of winning his first NBA championship, the internet’s writing hands are rushing to join his camp. 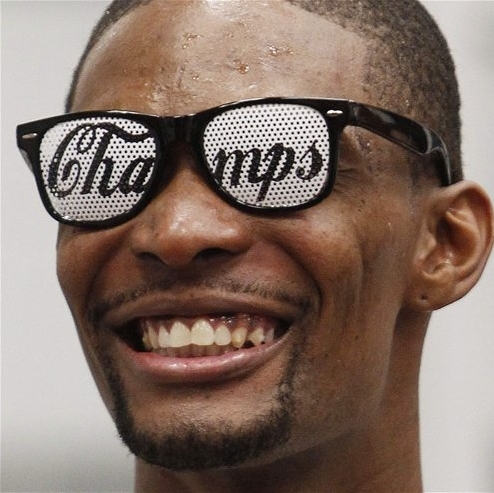 Whether they really are tired of harping on James for The Decision, the pep rally, and his promise of eight championships in Miami or they’re just following the old, adhere to one view for a long time and then publicly and suddenly change positions to get attention model, or maybe they see that James’ time is here and they want to be on the right side of history, everybody’s suddenly all-in on LeBron James. It is at this point axiomatic that athletes want to be musicians and musicians want to be athletes. The crossover usually doesn’t go so well in practice, however. It’s one thing for Michael Jordan to play baseball– one has to assume there’s a baseline of athleticism that translates between sports, even if we find out it’s not nearly as much as we expected– but what is it that makes us think Shaq, Serena, or Ron Artest can rap, or Prince can play basketball? Nothing should. What we see more recently are approximations. 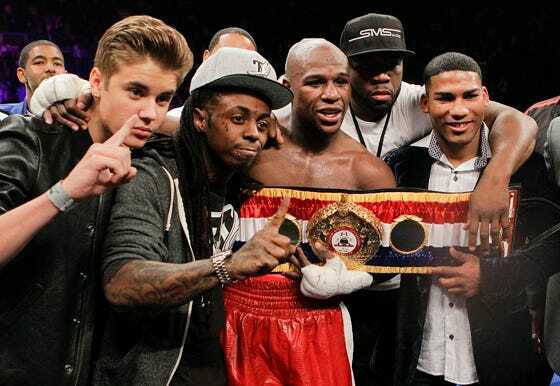 Justin Bieber, 50 Cent, and Lil Wayne in Floyd Mayweather’s entourage for the Cotto fight. Donald Driver winning Dancing With The Stars. Perhaps most curious is the musicians’ creation of fight songs for their favorite teams. The most famous example of this has to be Prince’s “Purple and Gold,” an unlistenable contribution to the Minnesota Vikings’ 2010 playoff efforts. (I’m not even going to link to it. Search at your own risk.) Who besides Charlie Murphy thought Prince knew anything at all about sports? Even fewer do after hearing “Purple and Gold.” That song should have served as notice that this is not the sort of thing ever to repeat. 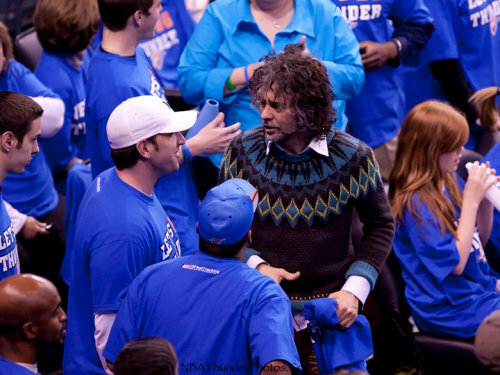 Two years later, though, here we go again: the Oklahoma City Thunder are making a promising playoff run, and the Flaming Lips– Oklahoma-based and recent performers at the Hangout fest— want to root them on with a new fight song, written and recorded last night, entitled “Thunder Up: Racing For The Prize!! !” “Purple and Gold” set a pretty low bar for these things, and the Lips manage to best that effort with a song that is at least semi-danceable, includes a rough history of Oklahoma City (the city), and generally sounds like a generic tune from the digi/indie/electro-pop band. What’s most immediately noticeable about these songs, even when they sound decent, is how overall awkward they are, as if these professional, successful musicians can do no better than any of us would in trying to write such a song.